You spend so much of your time preparing for the typical classes that kids have from grade school through to high school. You get folders, notebooks, binders, calculators, and all that sort of stuff for your academic education. But don’t go forgetting about the required, less academic physical education course your kid has. Gym class is a vital part to our children’s education! And it generally doesn’t require any textbooks, notebooks, or folders. That doesn’t mean it doesn’t need any attention while you’re preparing for the coming school year. Your kid will need a change of clothes as well as a bag to carry them. Lots of kids get duffel bags along with their footlockers for their summer camp stay, why not use the duffel bag for your change of clothes in gym class? Some of the duffel bags from Everything Summer Camp are probably too big to be reasonable options for a bag for gym class. The Go Big Duffel Bag, for instance, is probably a little overkill for what you actually need. Our duffel bags from JanSport as well as High Sierra, on the other hand are perfectly good candidates for your gym clothes carriers. 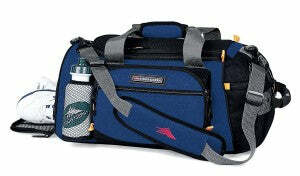 The Pack N’ Go Duffel from High Sierra can be carried like a duffel bag or like a backpack. And it’s got an easy-access pocket for essentials and frequently needed items as it’s never a bad idea to have your own stick of deodorant around after gym class or a bottle of water. You can also go with a classic, plain black duffel bag from JanSport. Made with wrap handles and shoulder straps, this duffel bag can be carried like a backpack too. And the small one (20″ x 12″ x 10.5″) boasts seven, convenient pockets on the outside. So don’t rack your brain on it or stick your dirty gym clothes in your backpack—bring your summer camp duffel bag and make life easier.